Herman Poole Blount didn’t have it easy. For African-Americans from Birmingham Alabama, that was almost inevitable, but he was ‘orphaned’ (or abandoned) by First Grade, living from that time with his Great Aunt, was imprisoned as a CO during World War II, being ostracised by his family as a consequence, and considered himself friendless. Believing with good reason the world to be a brutal violent place full of grasping spiteful men, he – the gentlest of souls – imagined at first – and then possibly convinced himself – he was from another planet, Saturn. He claimed to have met God personally – in New York, on 125th Street to be precise. For him, myths were facts, facts myths, and only one thing mattered: music. He sought refuge in it, learning to play piano by ear at eleven, and never looked back. His career blossomed and album and song titles suggested a supra-cosmological intelligence at work, although occasionally the music was at variance with that. But even the most grounded or earthbound of his compositions contain elements of his uniquely unorthodox method. As John Szwed notes: “Flatted fifths and augmented ninths had been used to enhance an ending or get to an interlude where people would look up and say ‘What’s happening now?’ But he used them all the way through.” He brought idiosyncratic sounds together as an arranger by encouraging each musician to play in a manner true to himself/herself – only they could make those sounds which revealed their true selves. For many years I couldn’t even listen to Sun Ra. Occasionally I would notice a slightly warped copy of The Heliocentric Worlds of Sun Ra Vol.2 peeking out forlornly from the back of my record collection – seemingly rejected, misunderstood. When I felt like playing some jazz I unwaveringly passed it by. Reflecting upon this now, I can see what went wrong. The Heliocentric Worlds Of Sun Ra Vol.2 was not an ideal gateway to his music. Be as well giving a copy of Metal Machine Music to a youngster eager to check out what all the fuss was about with Lou Reed. 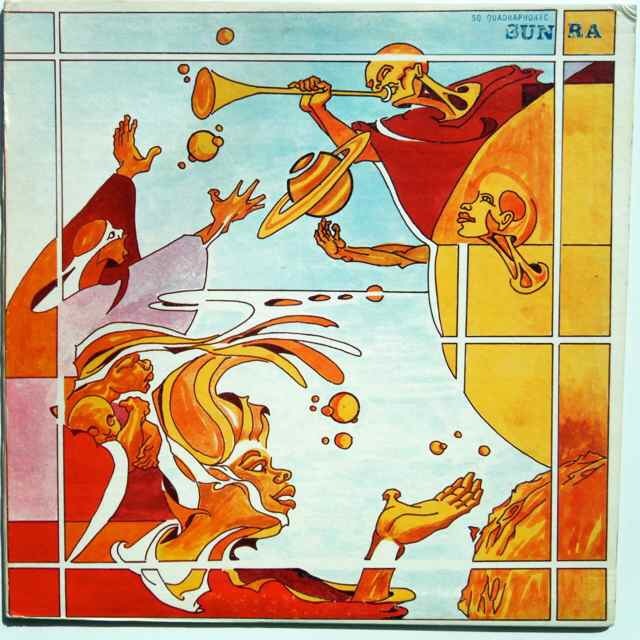 It was the first and last Sun Ra album I would buy after watching a documentary on television entitled A Joyful Noise around 30 years ago (the film was was made in 1980). I had been captivated by the unearthly sounds I heard as well as those strikingly flamboyant Arkestra costumes. I read what I could about him (there was strangely, little to read in those pre-Internet days) and music critics seemed to disagree as to which were his best LPs. Indeed, Sun Ra rarely makes an appearance in Greatest Albums polls, presumably because he recorded well in excess of 100 studio albums, many of which were only ever briefly available. There is such an exotic mystique about the man that many listeners want immediately to get their hands on something definitive. What they will find is that there is such an incredible musical variety in his output, that it is easy to become frustrated or bewildered and abandon the search completely, for even amongst the titles which occasionally resurface in articles and books as recommended recordings, there is no single unmistakable classic to fix on. The truth is that one could listen to a dozen or so Ra albums without gaining any insight into the intimidatingly latitudinous range of his brush strokes. Like many others I had given up on him after one album. I always had the intention of revisiting his music at some point, but tracking down Sun Ra albums can be a bit of a challenge: a small number of people have climbed Everest; less have a full house of Sun Ra albums. And getting a handle on which to give ear to is equally perplexing. His music ranges from big band, swing, straight bop, cacophonous free jazz, bizarre moog experimentation, polyrhythmic chanting, Afro-futurism and moody solo piano works, to gently funky space blues by candlelight. There’s even some disco out there. But if five or six albums are chosen very carefully, one may gain some measure of his music. So in a way I’m going to cheat a little here by identifying more than a few, and in truth the selection of Discipline 27-II if not quite arbitrary, is certainly not definitive. It is simply one of several superior outings which could have made the cut. If you’re looking for a way in, you may wish to try Space Is The Place and it’s sprawlingly funky title track, a futuristic interplanetary African spiritual. For a very accessible mid to late period introduction, Lanquidity and Sleeping Beauty (the latter is available on Spotify, you may have to search harder for the former) are superb. Check out the mellifluous ‘Springtime Is Here’ (from SB) – two chords, restrained solos; it’s a peach. You could track down something like ‘Omniscience’ from Aurora Borealis (1980) or become enchanted by the lopsided prettiness of ‘Where There Is No Sun’ from the 1978 double set New Steps. His earlier recordings Supersonic Jazz or Jazz In Silhouette are comparatively more conventional and may be more palatable to some; others may prefer to psych into those strange dissonant flutes and queasy strings that characterise his bonkers free jazz from the mid-60s (check out The Magic City or the two Heliocentric volumes). Instead, I’ve plumped for Discipline 27-II, recorded at the same session as 1972’s Space Is The Place, but long since unavailable. It might seem a less obvious choice than its sister, particularly as it does not even feature the best version of its title track – that honour goes to the ultra rare Live In Egypt ‘71 – but it’s an album which contains a sufficient blend of styles to make it a good starting point and it goes without saying that it contains some great music too. ‘Pan Afro’ typifies this approach, Ra’s improvisational piano knocking out all kinds of strange rhythms which are buried under a smooth funky sax riff from John Gilmore. There’s a beautiful trumpet solo too – not sure if it’s by Akh Tal Ebah or Kwame Hadi who both played on the session.’Discipline 8′ is at the other extreme – a barrage of horns attack one chord from different angles, the tension building until the whole thing unravels in a blaze of squawking sax and then disintegrates completely, the skittering listless drums knocked unconscious, like wounded soldiers on a battlefield. ‘Neptune’ is cut from the same cloth as ‘Space Is The Place’ – one of those elongated space chants (led by June Tyson: “Have you heard the latest news about Neptune Neptune Neptune…”) which somehow contrives to sound both utterly lackadaisical and yet super funky at the same time before everyone lets loose in a free orgiastic finale. Finally, the lengthy title track, despite criticism that it is over long – is one of The Arkestra’s most fully realised creations – this time it’s almost like an interstellar conversation (“For you I gave up everything I never had/For all I never had is the life I abandoned…you’re down here, all isolated from the rest of the planets/don’t you feel lonely?”) – the horns are brilliantly measured – the whole thing is joyful, tuneful and soulful in equal measure. Here the Arkestra sound like they have unlocked the secrets of the universe and in some ways they probably had.